Public Consulting Group’s (PCG) web-based progress monitoring tool EDPlan Progress Track provides teachers with simple data collection to proactively facilitate problem-solving, enhance student learning, and improve educational outcomes. In the sample graph above, each circle is an instructional data point based on student responses in each data collection session. When the student’s session responses became erratic, the data prompted the teacher to make an instructional change in order to increase this student’s achievement and thus, have a better chance of mastering the goal. After the instructional change occurred, over time, the student responses improved. Teachers can begin collecting the Individualized Education Program (IEP) goal data quickly. 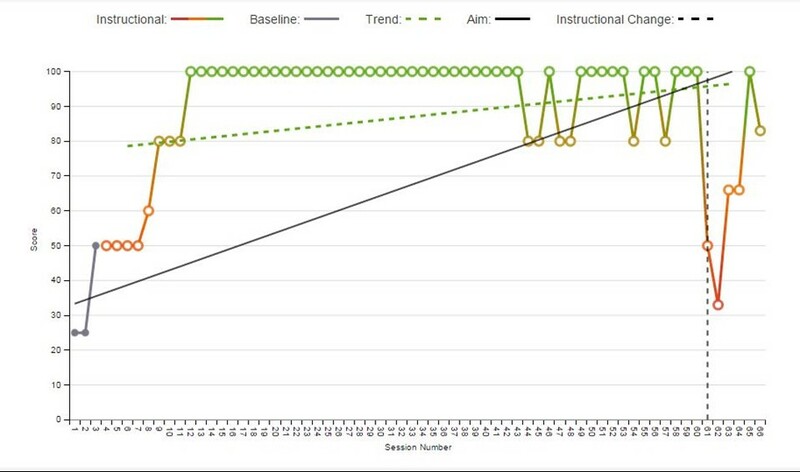 EDPlan Progress Track algorithmically produces the aim line, trend line, and status of each IEP goal based on data entered. No more graphing and calculating by hand. EDPlan Progress Track was developed in conjunction with our clients to provide students, parents, and educators with a software application to access a student’s IEP goals or objectives and document student progress on each one. Using progress monitoring data, administrators are able to determine if they need to assist their teachers by offering alternative methods and/or approaches to achieve student success. Additionally, administrators can analyze their special education student population achievements and areas of concern district-wide, by the school, by groups of students, and by the teacher.